Not to be confused with Hungerton, a hamlet in Lincolnshire. Hungarton (or Hungerton) is a small village and civil parish in the Harborough district, in the county of Leicestershire, England, about 10 miles (16.1 km) north-east of Leicester and 13 miles (21 km) south-west of Melton Mowbray. The population of the civil parish was 269 at the 2001 census, including Ingarsby, and increased to 289 at the 2011 census. The village has a church, a village hall, a small stream and a Millennium Green. It also has a pub called The Black Boy. Stilton cheese was first produced in a dairy in the grounds of Quenby Hall. The Anglican Church of St John the Baptist is part of a group benefice with Keyham, Billesdon, Goadby and Skeffington. A service is held there twice a month. The village features in the 1086 Domesday Book as Hungretone. The parish of Hungarton covers over 4000 acres (16 km²) of land. and includes the three estates of Quenby Hall, Baggrave and Ingarsby as well as the village. A bill to enclose common lands in the village was introduced in 1762. The village layout follows the model village built in 1764–76 by Shukburgh Ashby, then owner of nearby Quenby Hall. There are a few cottages that pre-date this and several houses have been built since. 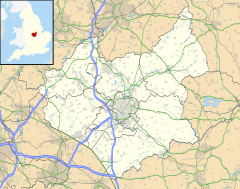 "HUNGERTON, a village, a township, and a parish in Billesdon district, Leicestershire. The village stands between the two branches of the river Wreak, 6 miles SE by E of Syston Junction r. station, and 7 NE by E of Leicester; and has a post office under Leicester. The township includes the village. Real property, £1,565. Pop., 196. Houses, 48. The parish contains also the liberty of Baggrave, and the hamlets of Ingarsby and Quenby. Acres, 2,910. Real property, £5,945. Pop., 302. Houses, 64. The property is divided among a few. Baggrave Hall is the seat of E. A. Burnaby, Esq. Quenby Hall has, for upwards of seven centuries, belonged to the Ashbys. Ingarsby Hall, an old moated building, is now a farm house. The living is a vicarage, united with the vicarage of Twyford and the p. curacy of Thorpe-Satchville, in the diocese of Peterborough. Value, £320. Patron, the Rev. E. Q. Ashby. The church is ancient; was restored in 1851; and consists of nave, chancel, and S aisle, with porch and lofty spire. There are a Wesleyan chapel and some charities." "HUNGERTON (St. John the Baptist), a parish, in the union of Billesdon, chiefly in the hundred of Gartree, S. division, but partly in that of East Goscote, N. division, of the county of Leicester, 7 miles (E. by N.) from Leicester; comprising the liberty of Baggrave, and the hamlets of Ingarsby and Quenby; and containing 267 inhabitants. The living is a discharged vicarage, with that of Twyford and the chapelry of Thorp-Satchville united in 1732, valued in the king's books at £9. 8. 1½., and in the alternate patronage of the families of Peacocke and Ashby; net income, £220." George Ashby (1656–1728), politician, was born at Quenby Hall and buried at Hungarton. Shukburgh Ashby (1724–1792), landowner and politician, was buried at Hungarton. Andrew Burnaby (1732–1812), travel writer and cleric, was buried at Hungarton. Louisa Cavendish-Bentinck (née Burnaby, c. 1831–1918), a great-grandmother of Queen Elizabeth II, was baptised at Hungarton. ^ "2001 Census: Key Statistics: Parish Headcounts: Area: Hungarton CP (Parish)". Office for National Statistics. Retrieved 28 September 2008. ^ "Civil Parish population 2011". Neighbourhood Statistics. Office for National Statistics. Retrieved 14 June 2016. ^ "Hungarton: St John the Baptist, Hungarton". achurchnearyou.com. 2015. Retrieved 2 November 2015. ^ Somerville, Christopher (2015). "Hungarton and the Deserted Villages, Leicestershire". christophersomerville.co.uk. Retrieved 2 November 2015. ^ "House of Lords Journal Volume 30: April 1762, 1-10". British History Online. 2015. Retrieved 2 November 2015. ^ "Hungarton with Twyford and Thorpe Satchville". familysearch.org. 2015. Retrieved 2 November 2015. ^ "Hungerton". British History Online. 2015. Retrieved 2 November 2015. Wikimedia Commons has media related to Hungarton. This page was last edited on 20 October 2018, at 17:08 (UTC).